Incredible location! 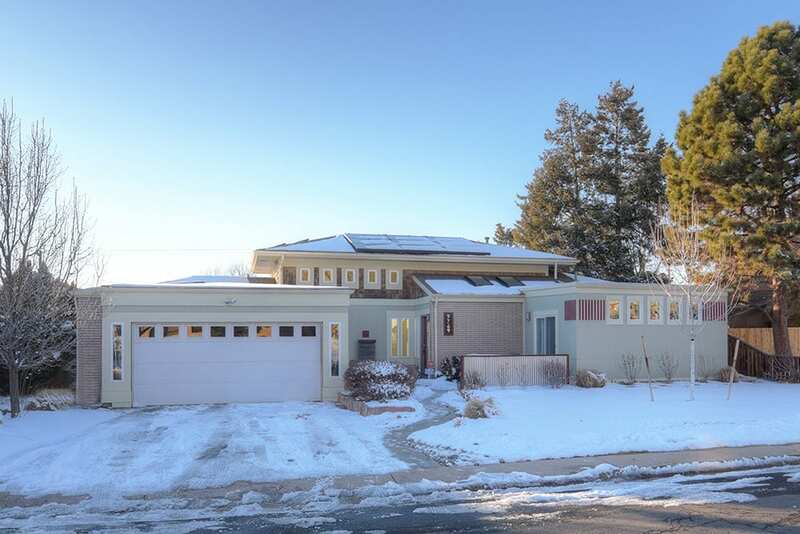 Modern ranch-style home with sweeping mountain views, just a short walk to Downtown Littleton. Originally built in the 50’s, this fabulous rebuild maintains a glimpse of the original character with exposed brick, blending perfectly with the new, ultra-modern, architectural design. Situated in the heart of Littleton’s historic district, this home offers the best of both worlds and is a must-see! Open and airy, the accommodating layout is flooded with natural light throughout and features soaring ceilings, a finished walk-out basement, two master suites and plenty of space to spread out. Perfect for indoor/outdoor entertaining, enjoy direct access to the deck from the formal living and dining rooms, both boasting pristine hardwood floors and remarkable mountain views. At the heart of the home, the kitchen showcases 42-inch cherry cabinetry, granite countertops, and a breakfast bar complete with modern stainless steel. Set privately apart, the main-floor master presents two sizable walk-in closets, a five-piece bath with exquisite finishes, and direct access to the courtyard. Also encompassed on the main floor is the comfortable family room, a three-quarter bath, and a versatile non-conforming bedroom. An ideal retreat for guests, the sunny, walk-out basement is comprised of an inviting sunroom, the second, generously-sized master suite complete with a jetted bathtub, the fourth bedroom, all new carpet and paint throughout, and plentiful storage. The terraced backyard paradise includes an expansive deck with mountain views, a covered paver-patio, a privacy fence, and a vivid array of lush perennials. Idyllic location, walking distance to Sterne Park and close to Ketring Lake and Littleton Museum with two 19th century homestead farms. Enjoy the proximity to Historic Downtown Littleton, a staple in the community: lined with turn-of-the-century buildings, the unique and charming Main Street offers specialty boutiques, restaurants, bars, art galleries, and more. Don’t miss out of this rare opportunity to own a truly incredible home in a wonderful neighborhood!